Move out in this elite warrior to fight rain, cold and crappy weather. Waterproof GORE-TEX keeps you dry while looking cool in military style. 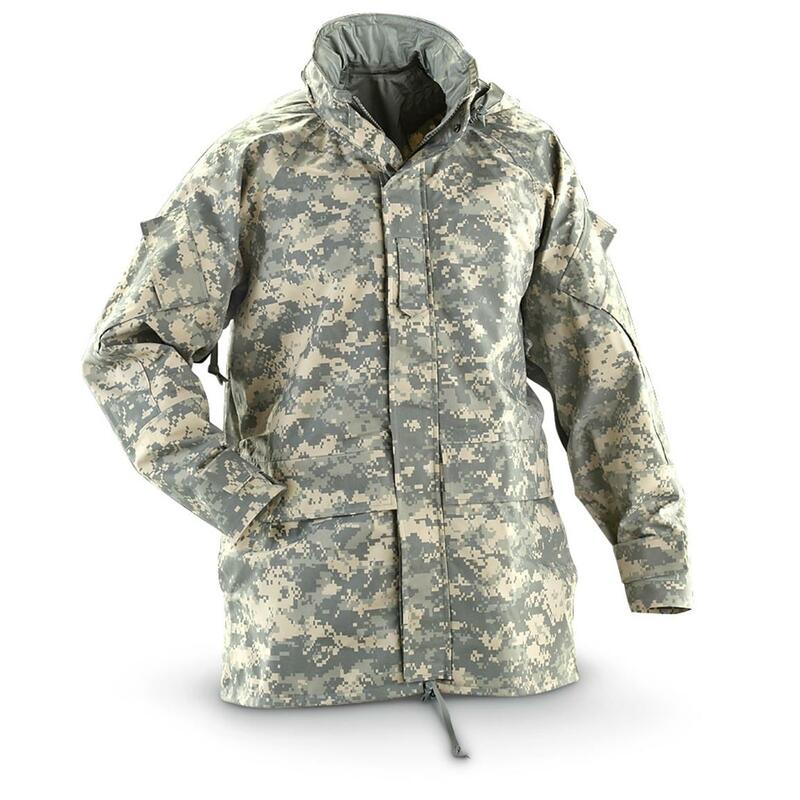 U.S. Military Surplus Army Digital GORE-TEX Waterproof Parka Shell, New is rated 4.6 out of 5 by 14. Rated 5 out of 5 by Steph from Quality is incredible!!! Jacket size was as advertised. the quality of this jacket is awesome. Rated 2 out of 5 by Trusting Gump from Could be better This parka shell is well made but would be much better if one could add an inner liner for cold weather. It is listed as a parka, which I associate with cold weather gear. Price is too high for just a shell. Read close before you buy. Rated 5 out of 5 by Rawhyde from Never issued as stated Ordered XXL which allows for loose comfortable fit during summer use and allows for layering a heavy jacket under the shell for winter use. Very comfortable as a windbreaker covering just past the hips. Hood rolls up and stores in collar. Has zippered ventilation under arms pits to elbows to allow for extra ventilation. Full length front YKK double zipper allows user to zip up from the hips to gain access to front pants pocket, holster, knife sheath etc. Has snaps on zipper flap versus velcro that the military new issue has. I like the snaps better as I find them to make less noise. The sleeve cuffs tighten by the use of a velcro strap. I also have a gore-tex woodland military field jacket which I use alot. I like the pockets on this one better as it has 6 outside pockets. Two bellow style pockets on the sleeves and two hand pockets and two velcro flapped pockets. I plan to set this up as a EDC jacket as the pockets will allow for the carrying of so many possibles. Rated 5 out of 5 by Bergie from Great piece of equipment This parka is the real thing. Well made and totally waterproof. I would buy again and do recommend this for anyone that plans to be out for any period of time when rain is a factor and staying dry is a must. You won't be disappointed by the performance of this parka. I used it during an overnight trip where I was exposed to a continuous rain for 8+ hours and I remained dry the entire night. Rated 5 out of 5 by Jim46 from Military Spec This is Military spec I don't have to say more and the fit is right on.